This month I am fixated on several things (like reading personal ads in the New York Review of Books, which surprisingly include a large number of people over 80 seeking love), but I’ve managed to narrow them down to five. I am so obsessed with the sequel to this book…and it hasn’t happened yet. Penguin UK is celebrating female authors and characters this month, check it out here at Five Dials. There are brilliant essays and fiction from Lydia Davis, Jeanette Winterson, Ali Smith and more. So many interesting stories about Virginia Woolf, Muriel Sparks, Katherine Mansfield, etc. Also check out the Penguin UK blog post here. Lemon Meringue pie. Bake and enjoy. In college lemon meringue was a savory pie that served as dinner and dessert. Rediscovering a lost dessert is amazing. So if you’re not obsessing over lemon meringue pie, take time to find your dessert. Ingrid Michaelson. I can’t get enough of her music. Her latest song, “Time Machine” is playing in my head right now. The only thing better than her song is the music video, which is hilarious. Alexander McQueen. I have a proper obsession with Alexander McQueen’s dresses and coats. The clutches are a work of art. Beautiful and unattainable, sometimes I go to Neiman Marcus and just stare. Shhh… stare with me. Currently using every ounce of strength to stop myself from buying this dress. Patti Smith. I’m embarrassed to admit that I had never heard of her until the Hamish Hamilton publishing director tweeted about Smith. Where have I been? 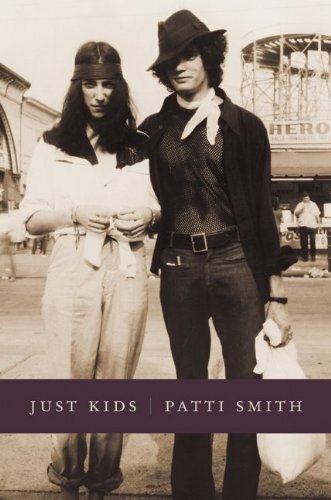 Yes, there are generations between us, but seriously, how did I miss Patti Smith? Her raspy voice is magic. I listened to Just Kids while traveling (it was my very first audiobook) and now I want to read the sequel. She encapsulated New York City in the 1970s. I’m fascinated with anyone who lived in the Hotel Chelsea. Two airports later, I silently worshipped Patti Smith and wanted to abandon Connecticut and wander around New York City.